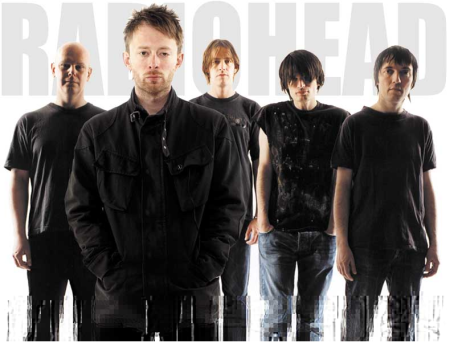 Finishing their tour of the UK, Radiohead appeared on the massive stage at the Lancashire Cricket Ground to give an electric and eerie performance in front of fifty thousand fans. Promoting their newest album, In Rainbows, the band look to tour Europe and are heading back to the US to conclude their world tour. Such were the cries from new-age hippy Radiohead fans exiting Lancashire Cricket Ground on Sunday evening. One would think that the fan that made this statement may have enjoyed himself a little too much, and was probably a creation from the jostling crowds beneath the stage, aired out with thick green smoke. Keeping with the green theme, the entire gig was powered carbon neutrally (the lighting cost thirty-pound for the entire show), probably at the request of Thom, who edited the ‘g2’ supplement for The Guardian a month ago for a special on climate change. The downside to this was, with the crowd spurred on to do their bit for the environment, fans crammed onto the Metrolink after the gig to lower their footprints, which they aptly treaded on after making a tram derail under the weight on its way to Piccadilly. Despite the stereotypical arrogance often associated with Radiohead fans, Brooklyn-based disco hippies MGMT were accepted well, opening the evening with their feel good, slow-town anthems of ‘Time to Pretend’ and new single ‘Electric Feel’, as well as an assortment of other songs from their debut album ‘Oracular Spectacular’. Mexican-style ponchos, coupled with retro sunglasses worn constantly by most of the members. The high vocals both original members Andrew Vanwyngarden and Ben Goldwasser were slight comparisons to the main attraction later to come. Both members took up the stage in Native American attire to dance off their set in a spiritual, electric jig to end a refreshing set. Keeping with the Native American dress sense was Bat For Lashes, with female vocalist Natasha Khan heading the far-out four piece complete with psychedelic lyrics and surreal fusions of music spanning decades of influences, which certainly was something different for the crowd, which was a big thing for a crowd used to the confusion created by Yorke and co. over the years. Although a different and fresh set, you couldn’t help thinking you’d seen it all before, after all, Khan is widely commented on as being the ‘English Bjork’. Still, a good set and warm up for the main course. The bright evening sky, dimming gradually in the bowl of the stadium, was the perfect stage for the spectacle to come. Thom led his men onto the plateau above the adoring fans waiting in anticipation, starting off the set with In Rainbows opener ’15 Steps’, followed by songs ‘Optimistic’, ‘Where I End’, ‘2+2=5’, and ‘There There’. ‘Bangers and Mash’ saw Thom take up the drums, whilst ‘Everything In It’s Right Place’ saw the iconic vocalist play beautiful on the piano whilst singing in his familiar, angelic transpose. Infrequent utterances from Yorke and Greenwood introduced some songs in a fairly non-chalant way, saying “Have you ever heard of a politician who…” before playing ‘National Anthem’, and making a snide jibe at the ‘Arctic Monkeys’ before another. Unsurprising to the audience was that ‘Creep’, a song hated by frontman Yorke, did not feature in the set, as it has never done since the band’s homecoming gig in Oxford eight years ago. Despite this, renditions of classics such as ‘Just’, ‘Paranoid Android’, ‘Fake Plastic Trees’ and ‘Karma Police’ went down extremely well with the mesmerised crowd, as did In Rainbows single ‘Jigsaw Falling Into Place’. ‘No Surprises’ ironically surprised the crowd as it is not a popular song featured in the group’s performances. Ending the gig on ‘Lucky’ for their third and final encore, Radiohead left the stage blessed with their surrealism and twenty-first century Floydian vibes and set their twenty-first century hippy fans to their euphoric and tram-breaking trek back home.